Fuller, stronger, healthier hair. Hair is reawakened. 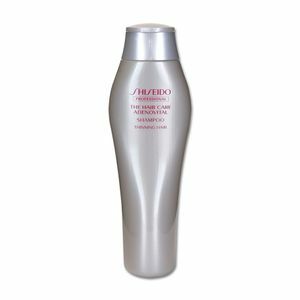 If you're looking to promote hair growth due to current hair loss concerns or you want to get volume in your hair, then consider using SHISEIDO Professional Adenovital Shampoo. The Shiseido's Adenovital series focuses on strengthening hair at the root, making the whole hair strand more resistant to damage. It brings out maximum hair growth and prevents thinning, dandruff, itchiness, and hair loss. The Adenovital Shampoo gently and thoroughly cleanses the scalp. ※ Avoid contact with eyes. If irritation occurs, stop using and consult a doctor. Step 1: Adenovital Shampoo - Wash your scalp and hair clean. Step 2: Adenovital Warming Primer - Lay the groundwork for treatment on your scalp. Step 3: Adenovital Optimizing Gel - Enrich your scalp with a moisturizing gel. Step 4: Adenovital AD Booster ad - Help the gel absorb into the scalp with a professional tool. Step 5: Adenovital Seal-in Spray - Converge the treatments to maintain their effects on your scalp. Step 6: Adenovital Scalp Treatment - Prep your scalp. Step 7 & 8: Adenovital Advanced Scalp Essence - Promote the growth of full, silky hair and massage. Key ingredients in the Adenovital series include Adenosine (Shiseido’s original ingredient), AP Stimulator (moisturizing ingredient derived from apricot), Ononis Extract (fortifying agent), and AG Complex (moisturizing agent derived from Ashitaba extract, Lingzhi extract, Japanese pepper extract, and sorbit). There Are So Many Shiseido Shampoos! Which Shiseido Shampoo Should I Use? Looking for the best deals for SHISEIDO Professional Adenovital Shampoo?